Promotional Items for tight purse strings. Its always good practice to review your marketing collateral and ensure that all the items in your marketing toolkit are up-to-date and represents you in the best light possible. For some small businesses or those who have a limited budget, the task of sourcing cost-effective, quality promotional items can be a real struggle. That’s why we’ve taken the pain out of this for you by presenting our best sellers for under £1! Get into the hands of your clients with branded pens. Our most popular pen shape is the Contour. It has a good range of funky colours available. In our experience, they look best with just a 1-colour print; silver is smart because it complements the silver fixings but, we will print whatever colour you wish. Secondly, you can split the minimum order quantity of 250 between two barrel colours. If your logo is two colours say, red and blue, you can print your colour in white or silver and have 125 red pens and 125 blue pens – giving you a choice of pen colours when you hand them to prospects and customers. How much? For 250 pens, with a 1-colour print, they are 50p each. If you’d like us to quote for more than 250 or if you’d like a different pen shape, chat with us online. There’s nothing quite like crossing off a tricky task or having a handy-sized pad to jot down moments of genius. So, why not give our your own, branded notepads for your contacts to do just that? Our most popular size is A6 (105mm x 148mm) or DL (99mm x 210mm). Our prices include a full-colour print, so there are no limitations to the design. Each pad contains 50 sheets of white, uncoated paper and has a backing board. Top tip; get funky by adding a textured image or pattern in the background. How much? For 250 A6-sized pads, they are 58p each. The DL size pads, which are similar to jotters, are 68p each. This price includes 30-mins artwork setup cost so, all you have to do is send us your logo, tell us what you’d like your notepads to look like (roughly*) and we’ll do the rest. *If you don’t have any ideas – that’s fine because we have plenty! If you’d like us to quote for more than 250 or if you’d like a different size, chat with us online. Make your message stick with branded sticky notes. If you host events, conferences or training activities, sticky notes can be beneficial for group sessions because they reinforce a message from your training program or just simply, remind delegates of your brand. People often take them back to the office, which makes your advertising last even longer. Top tip; allow enough space for someone to write. Many designs we see are very cluttered and don’t allow very much room for note-taking. How much? For 250 square pads (72mm), they are 98p each. This price includes artwork setup so, all you have to do is send us your logo, and we’ll do the rest. It won’t matter how many colours are in your logo because the price includes full-colour printing. Whatever the season, make it the season to be jolly by having a stock of branded greetings cards ready to send. Have some cards, ready-to-post makes sending a celebratory note or wishing someone a happy birthday, a lot easier. 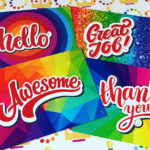 Not only will you look super organised but, super professional too with cards that have your branding printed on them. How much? For A6 size (same size as a postcard), they are 46p each. For A5 size (half of an A4), they are only 4p more (50p each). Prices not only include full-colour printing, inside and out but white envelopes too! To create a bespoke design for you, add on £40 to cover 1 hour’s studio time. If you’d like a full price list, chat with us online. Whatever the occasion, make it go with a bang with printed balloons. For a corporate event, branded balloons will make you look super cool. Top Tip: Split your quantity between a choice of base colours, and you’ll make the venue even more colourful. As long as the print colour stays the same, it will not cost any extra. How much? For 250 balloons printed one colour, one side, 44p each (choose up to two base colours) or stock up with 500 balloons at 25p each (choose up to four base colours). If you’d like a full price list, chat with us online. With these top five promotional items, it just goes to show that there is something to fit most budgets and look awesome in the process. If you’d like to chat through your ideas or would like more information about these printed promotional items, call 01332 418377 and speak to one of the Print Angels.